For those born February 9, 1953. Not your birthday? Find your timeline here. You're one of the first people who's never lived in a world without seat belts in cars. In January 2016, Adrienne LaFrance wrote about why cars have become safer while gun safety has remained relatively stagnant. Around the time you were born, the Soviet Union broke off relations with Israel. In April 1947, Eliahu Ben-Horin wrote about the controversy surrounding the creation of a Jewish state in Palestine, as post-war tensions mounted between Soviet Russia and the West. You were born in February of 1953. This year, The Atlantic celebrates its 160th birthday, making it 2 times as old as you. The year you were born, Joseph S. Clark, Jr. wrote about how the American liberal movement could recapture the political power it had lost in the 1952 elections. This is what Hollywood thought teenagers looked like the year you became one. The Monkees was released in 1966. At 16 years old, you were alive to behold people walking on the moon. Over the years, the moon landing has come to be lauded as the pinnacle of human achievement, although it was often derided at the time. In 1963, NASA astronauts took to The Atlantic to plead the case for landing on the moon. Around your 18th birthday, the U.S. spacecraft Apollo 14 successfully landed on the moon. In September 2012, Alexis C. Madrigal told the story of the forgotten opposition to the Apollo program. In 1985, Cyndi Lauper, who was born the same year as you, earned a Grammy for Best New Artist. In April 2014, Emma Green wrote about feminism and Lauper's single "Girls Just Want to Have Fun." 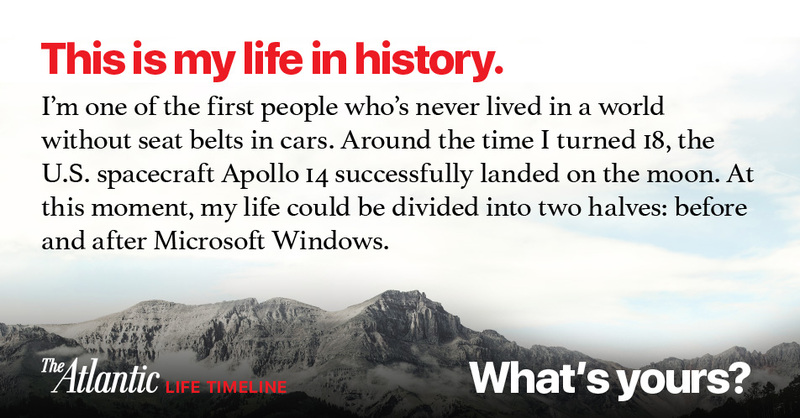 Your life can be divided into two halves: before and after Microsoft Windows. In December 2006, James Fallows wrote about Microsoft's efforts to improve the influential operating system. When you turned 54, you watched humankind reach the outer solar system. With NASA's Cassini-Huygens mission in 2005, humans landed a probe in the outer reaches of the solar system for the first time, a moment Ross Andersen called the most glorious mission in the history of planetary science. By the time you turn 67, scientists estimate it will no longer be possible to keep global temperatures from rising at least 1.5 degrees Celsius. In December 2015, Robinson Meyer wrote about why scientists had accepted this fact. History is happening all around you, every day. Sign up to be notified of any future updates to your timeline. View the timeline for someone else's birthday.